Ref: Extracts of Odell Registers on File ELF. ALSTONE (VERE. JOHN), s. Rowland, Odell, Beds., gent., Lincoln Coll. 1706, aged 17 ; B.A. 1709 (as John) rector of Odell 1714 till his death in 1762. Rev Vere Alston make a memorable contribution to the history of Pavenham, as the sixth son some means of livelihood had to be found for him, so he was given the living of Odell, where he remained as vicar from 1714-62. It was he who, for some reason unknown and despite the existence of thirteen siblings, inherited the Pavenham manors in 1697. He is remembered on account of a single exploit described by a brother cleric, the Reverend Benjamin Rogers, Rector of Carlton, in his diary of 1727-47. Mr Vere John Alston had a fall from his horse which endanger'd his life; it was in Pavenham lane, having been at his Brother's and (as it is said) drank too much. September the 2nd. It is fear'd he will die. Note that upon my enquiry of him at his house when I went to see him, he told me that the day he had been so unhappy as to fall from his horse, he had been at Mr. Lamb's of Sharmbrook, where he din'd, and assur'd me that they had but 2 Bottles of Wine, which however disorder'd him; that he came from thence about 4 in the afternoon; that as he rode over Sharmbrook field (Sharnbrook was not enclosed till 1811). Sir Rowland Alston, his Brother, met him, and Seeing him disorder'd by Drinking wou'd fain have had him went home with him and take a Bed there; but he woud not; and so rode homewards. Sir Rowland sent his Steward Tarry after him, who rode with him some little part of the way; but Mr. Alston clapt spurs to his horse, and, coming into the road at Chellington Fox, (an Inn now demolished 2003) his horse fell into a cart track and down he came, throwing Mr. Alston and falling over him but beyond him too, so that he was not at all hurt by him. Several years before he died in 1762 or 1763 Vere John sold his Pavenham Manors to the same brother who had rescued him from the cart track, Sir Rowland, A Baronet, of Odell Castle. His real estate, Dale cottage and a few acres of land, he bequeathed to another clergyman who had married into the Pavenham Alston family, the Reverend John Lord. 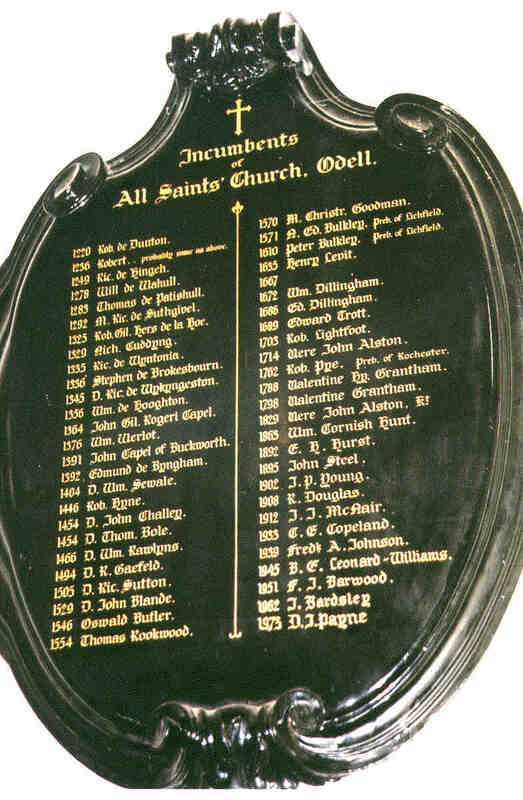 1685 Vere was Rector of Odell 1714 - 1762, he died aged 77. Buried in the chancel of Odell church, his ledger stone is now very damaged (2004) but read "To the memory of Vere John Alston rector of this Parish to which he was instituted 22 July 1714. He died 20 June 1762 aged 77"
He paying thereout all my just debts mortgages funeral and other expenses and I do hereby desire my said executor herein after named to bury me in a decent Christian like manner at his own discretion but without any pomp or unnecessary grandeur Lastly I hereby nominate constitute and appoint the right Rev Mr John Lord sole executor of this my last will and testament hereby revoking all other and former Wills by me at any time made and declare this only to be my last In witness whereof I have have hereunto set my hand and seal this 10th day of May in the second year of the reign of our sovereign Lord George II of Great Britain France and Ireland King defender of the faith and in the year of our Lord 1762. Signed and sealed published and declared by the said Vere John Alston the testator as and for his last Will and Testament in our presence who at his request and in his presence and in the presence of each other have set our names as witnesses thereof Thos Witworth, John Amis, John Cavit. Parish died the 20th June 1762, aged 77. The Will of William Alston of Pavenham co Beds  was proved 1736 by his wife Anne. In it the testator refers to his father Mr Vere Alston, leaving him a legacy. Cresswell was unwilling to include this man as Vere's son. Citation of Rev. Vere Alston, Tho. Warner, Jn. Harrison. 13 June. Genealogica Bedfordienis, Frederick Augusta BLAYDES, Genealogica Bedfordienis. 3. Church Records, Church Records. July 26thnVere John Alston and Sarah Gofe both of Pevanham, Bedfordshire by Licence), Bolnhurst. July 26thnVere John Alston and Sarah Gofe both of Pevanham, Bedfordshire by Licence), page A44, Odell PR. July 26thnVere John Alston and Sarah Gofe both of Pevanham, Bedfordshire by Licence), Daventry. July 26thnVere John Alston and Sarah Gofe both of Pevanham, Bedfordshire by Licence), Odell. said county was married by Licence July ye 2). July 26 th Vere John Alston and Sarah Gofe both of Pevanham, Bedfordshire by Licence), Harrold Registers.